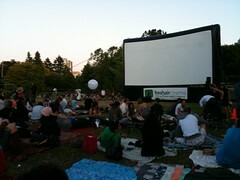 Vancouver’s outdoor movie series return this summer to one of our city’s most beautiful settings. The West End BIA will be hosting Dinner & a Movie, free outdoor movie nights in Ceperley Meadow at Stanley Park (right near Second Beach). Moviegoers are encouraged to get some take out or pack a picnic dinner and join others on the lawn to watch the featured film. All movies will begin at dusk and in case you’re wondering, conveniently this is not taking place during the Celebration of Light fireworks. One of the most common Google searches that leads people to my site is for Outdoor Movies in Vancouver so I know this will be one popular event. Hat tip to GayVancouver.net for tweeting about this and putting the event on my radar. Be sure to make it down early and bring your blanket for a family-friendly evening under the stars. Update I wrote an article for TV Week Online about the free outdoor movie series happening at Nat Bailey Stadium as well. All movies start at dusk. Approximately what time is that? One can presume its about 9pm ish.. since we do have a late sunset.